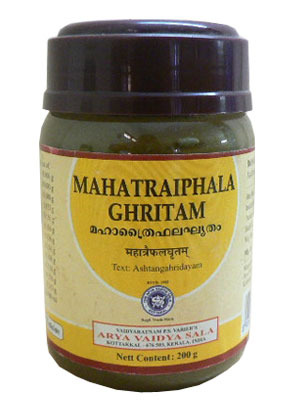 Maha Triphala Ghrita is a medicated ghee which acts as an excellent eye toner. It can be used internally as well as externally (Akshi Tarpana). It improves vision, regulates intra-ocular pressure (Glaucoma), reduces infections (Conjunctivitis) and delayes Degenerative Diseases of the Eye like Cataract.